Location: 23400 Park Road 12 Washington, Texas. Washington is about 80 miles northwest of downtown Houston. The nearest large town is called Navasota. 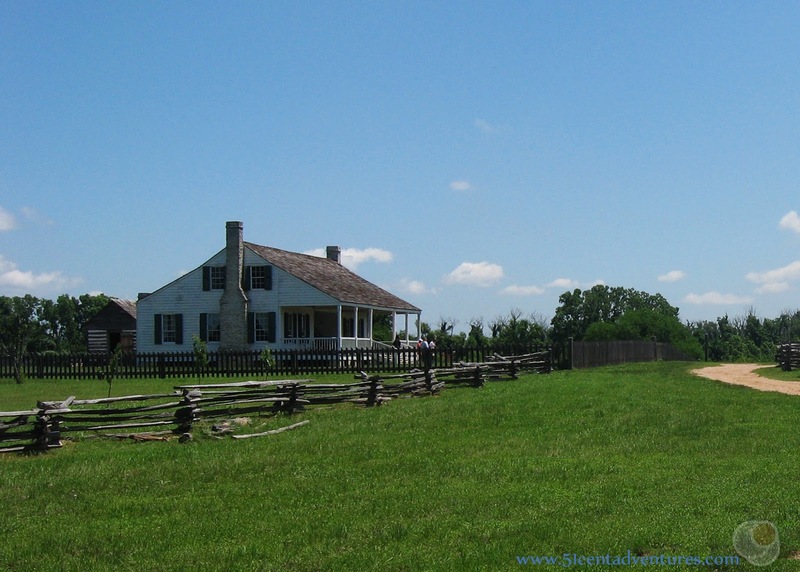 Cost: There is not entrance fee to the park, however there are site fees for the Star of the Republic Museum, the Living History Farm, and Independence Hall. You can pay $5 per place or you can purchase a Brazos Pass for $9 that will get you into all three places. 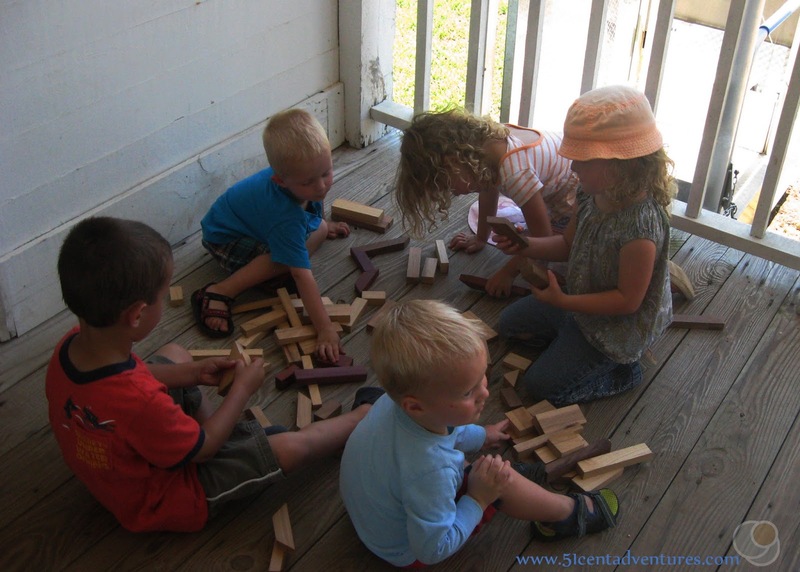 Children under 6 receive free admission. There are also family pass options. If you have a Texas State Park pass you receive free admission to everything except the Star of the Republic Museum. Operating Seasons and Hours: The park is open every day from 8:00 am to Sunset. The Visitor Center is open from 10:00 to 5:00. The Farm is open from 10:00 to 4:30. 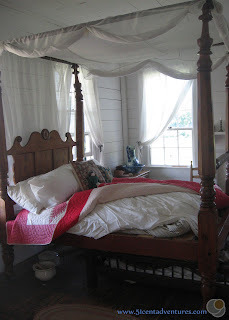 This part of my Texas Hill Country Day Trip Ideas series. I'm catching up on writing about places my family visited when we were living in Fort Hood, Texas from 2013-2015. My husband was sent to Korea for most of 2014 while I stayed in Fort Hood with our four children. We got through that time with help amazing friends and neighbors. We were also helped out by a string of visits from family. One of my sisters came out to visit in the middle of June. She and her family came to my house for a few days, and then we all went to Houston to spend time with another one of my sisters. Between the three of us sisters we had nine children - all under the age of six. It was the middle of a hot Texas summer. Ideally we would have spent most of our time indoors with the air conditioning. But with that many little kids we had to plan several activities to get us out of the house. 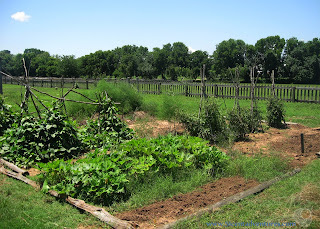 One place we visited was the Barrington Living History Farm at Washington on the Brazos State Historic Site. 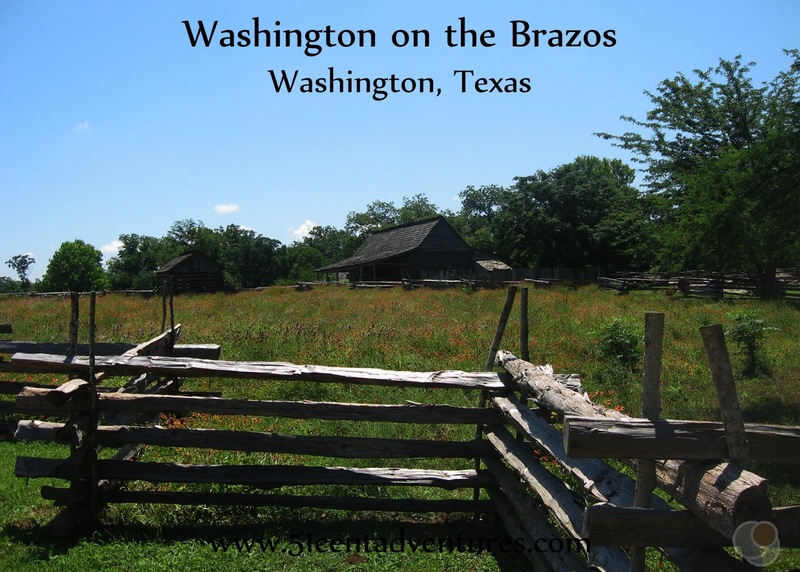 At the time I wasn't very familiar with Texas history in general or Washington on the Brazos in particular. 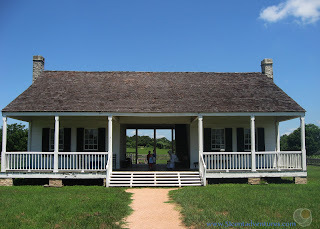 I didn't know that Independence Hall, the site where early leaders of Texas declared Independence from Mexico in 1836, was located at this state park. If I'd known that I probably would have made sure we visited that part of the park. Instead we spent most of our time at the Barrington Living History Farm. Which was very interesting too. This farm was originally owned by the last President of Texas, Anson Jones. He was president in 1846 when Texas became a state in the United States. 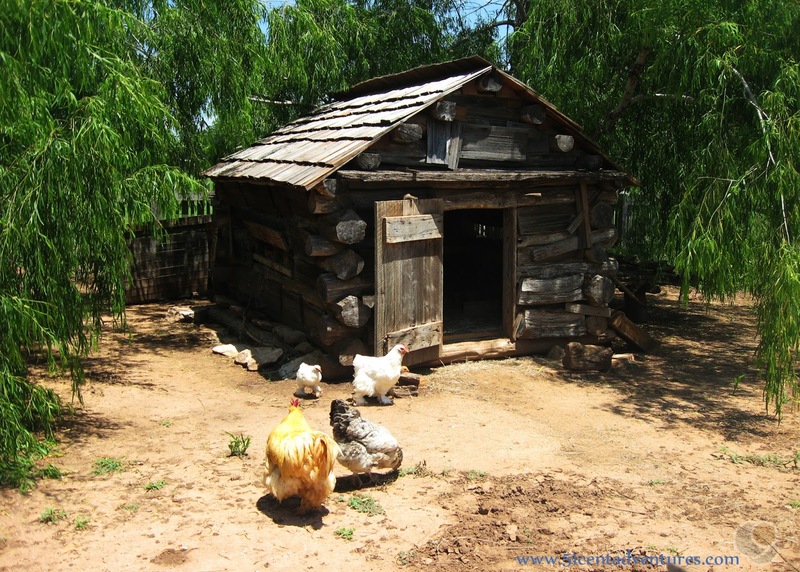 This was his farm both before and after his presidency. 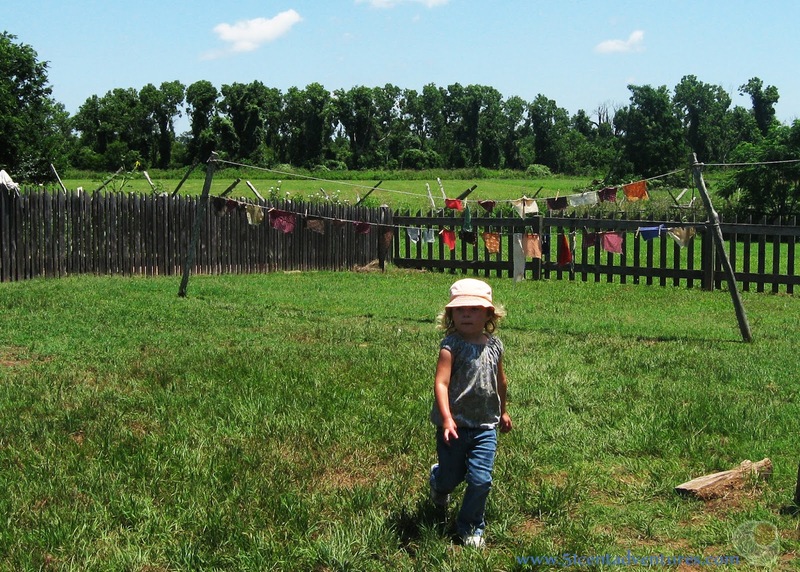 These days its a living history farm where visitors can learn about farm life in the 1800's. We were there on a hot day in June, so walking toward the house was a hot and sweaty stroll. This house was built with a breezeway in the middle of the house. This was basically the 1800's version of conditioning. We were so happy to reach that shaded porch. Thank's to it's design there was a constant breeze blowing through the center of the house. It was much cooler there than out in the hot sun. We spent a lot of time on the porch enjoying the breeze and shade. The cousins all had fun playing with these blocks. A park worker, dressed in period clothing, told us the history of the house and about the people who lived and worked there. The rooms are decorated as they might have looked 150 years ago. 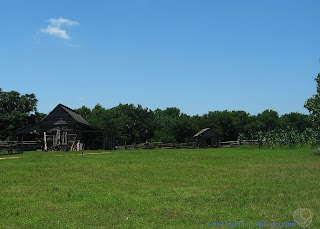 This living history farm does a good job of looking like it was really still in use. There was a little garden behind the house. And there were fields of cotton beyond the fences. I hear that in the fall visitors can come to the farm and help pick cotton. 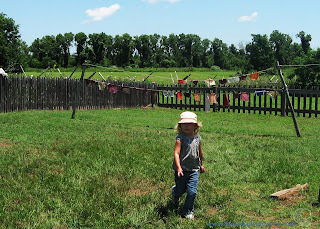 There was a clothes line set up and a place for children to scrub and rinse clothes. One of my daughters spent a long time playing with the pretend laundry. They also had a little chicken coop set up. My son really liked watching the chickens. The farm also had a barn. This barn wasn't for animals. In the south it never really gets cold enough for animals to need shelter in the winter. Instead it was built to store equipment. The weather was super hot so pretty soon we decided to ditch the 1800's life and return to our air conditioned cars. We all drove to my sister's house. The heat had given me a headache and I was seeing a few spots as I drove. I took some medicine at my sister's house and drank a lot of water. Soon I was feeling much better. The 1800's are fun to visit - but I wouldn't want to live there. Recommendation: Washington on the Brazos is a excellent place to learn about Texas History. 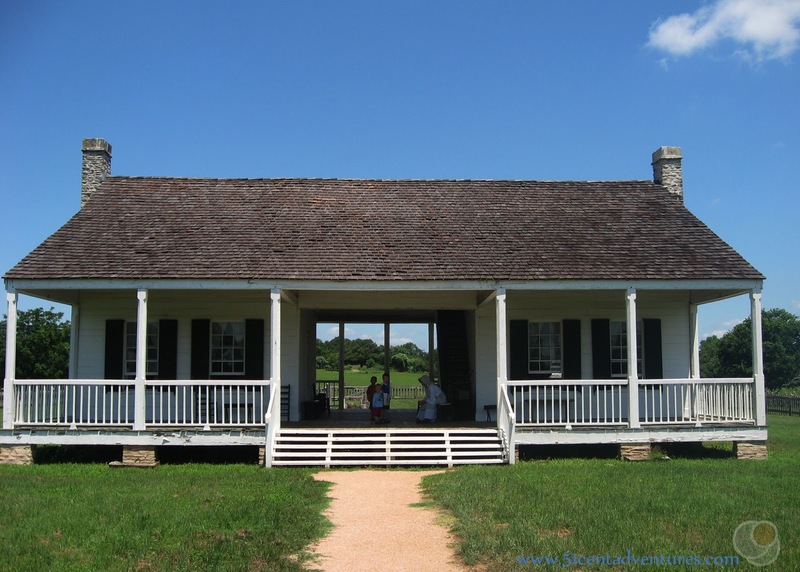 The well preserved buildings and property will give you a glimps into the past as you try to imagine what life was like for the people who shaped Texas into an amazing state. Directions: Washington on the Brazos is located about 80 miles northwest of downtown Houston, and 100 miles east of Austin. Highway 6 runs east of the site. Places Nearby: Brenham, Texas is about 20 minutes west of Washington on the Brazos. That town is home to a Blue Bell Creamery. When we lived in Texas the creamery offered tours. However, those ended when the whole listeria outbreak happened back in 2014. Tours are no longer offered at the creamery, but they do have an ice cream parlor. Blue Bell ice cream is amazing and eating Blue Bell ice cream while you are in Texas is a must.